Last week, relatives of the 29 people and two unborn children murdered in Omagh won a historic court case against the Real IRA bombers who slaughtered their loved ones. In our final extract from a new book charting their 11-year fight for justice, we reveal that an unlikely hero was the then Northern Ireland Secretary Peter Mandelson. Many others were too terrified of the terrorists to help or even donate money, unlike our readers, whose generosity in large part funded the campaign. The bravery it took for the relatives of those murdered in Omagh to bring the bombers to justice should never be underestimated. Their campaign pitched these ordinary families against men of the Real IRA, for whom violence was second nature. Yet in the ten years it took to get the bombers and their sidekicks into court, almost all those who set out on this risky course were still there at the end. One event that stiffened their resolve  and tested their courage  was a fund-raising evening in August 2000 held in a pub in a strong republican area in Belfast by the 32 County Sovereignty Movement (32CSM), the political wing of the Real IRA. News of it caused the families great distress. ‘There were tears in my house when we heard of it,’ said Michael Gallagher, who lost his son in the bombing. Victor Barker, whose son had also died, organised a protest, and 17 relatives, having just endured the trauma of the second anniversary of the atrocity, turned up in the car park outside Brennan’s Bar. The organisers of the event had described it as a night of ‘craic agus ceol’ (fun and music). ‘There has been little singing in our homes,’ the protesters declared as they stood holding placards with photos of their dead. For two hours, the Omagh relatives handed out leaflets. They were ignored or angrily rejected by some of the 250 attending the fundraiser. One man told Lawrence Rush, still mourning his wife of 40 years, that he was nothing but a sad old zombie. To Gallagher’s wife Patsy it felt good to be letting the Real IRA know that here was a group of people who were not scared of them. Then they marched inside and handed a letter of protest to the woman behind the bar. ‘For the sake of the dead of Omagh, please stop this fundraising now,’ it read. Victor Barker ran upstairs and tried to crash the function. Barred by bouncers, he demanded to speak to a representative of the 32CSM and, to his surprise, the chairman Francis Mackey, an Omagh councillor, emerged with two shaven-headed minders. The protesters were ejected by police, who arrived in riot vans. Some officers made it clear where their sympathies lay, but that was little consolation for the relatives. They felt, as they had done so often since that bomb went off in August 1998, that the law was on the side of the law-breakers. 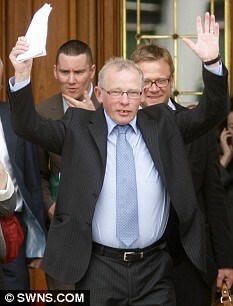 Let down by the criminal justice system, they were embarking on a plan to sue the Real IRA in the civil courts. ‘We will challenge them until we get justice,’ Victor Barker pledged. Ulster politician David Trimble congratulated the families on their courage. ‘The Omagh relatives are an inspiration to all of us who want to see an end to terrorist violence,’ he said. Meanwhile, another politician was showing himself to be an unexpected ally. Peter Mandelson, replacing Mo Mowlam as Northern Ireland Secretary, was taking a personal interest in the plight of the Omagh relatives. This was in contrast to Mowlam, who had seen their refusal to grieve silently as jeopardising the peace process. But Mandelson was genuinely repelled by terrorists and was, in fact, doing his best to resist pressure from Downing Street to make concession after concession to Sinn Fein and the republican groups in order to keep the peace process on track. 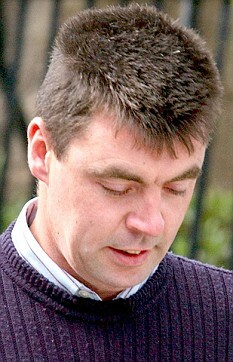 Despite the opposition of his officials, who were pursuing Mowlam’s policy of playing down expectations of bringing the bombers to justice, Mandelson insisted on meeting the Omagh families. When asked by journalists if he backed the civil action against the bombers, Mandelson said he welcomed ‘anything that brings pressure on the bombers’. It was a reply that must have annoyed those of his colleagues who were anxious not to rock the boat. 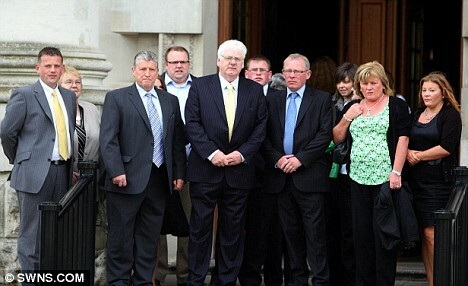 The Omagh group at last had at a real friend at court. Mandelson’s support, both moral and financial, continued after he resigned as Northern Ireland Secretary, and he was crucial to the success of the whole endeavour. So, too, was Tory peer Robert Cranborne, who stumped up the seed-corn cash needed to find a lawyer and get the civil action under way. The man who took on the case was Jason McCue, a buccaneering London solicitor who favoured jeans, boots and designer stubble and was nicknamed ‘Indiana Jones’. The legal work he enjoyed was the exotic, the adventurous and the boundary-pushing  especially if it included standing up for victims. Those who met him were struck by his charisma, his confidence and his quickness of thought. Courageous to the point of recklessness, he was an old hand in the area of terrorists and the law, and had fought libel actions brought by IRA members against newspapers. Suing a paramilitary organisation was right up his street. He had long been incensed that terrorists were using the civil law  and yet no one seemed inclined to use it against them. 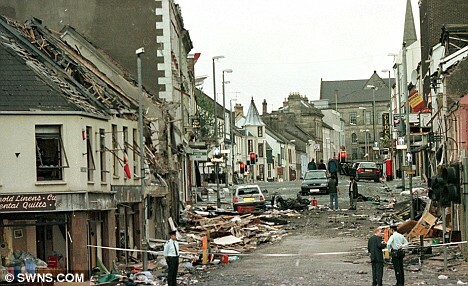 car carrying the 500lb bomb exploded in Omagh on August 15, 1998.
confronted the head of the 32CSM. But getting the right lawyer was just the start. This was a huge and ground-breaking case and it was inevitably going to eat up money. Funds were desperately needed, and Cranborne, an experienced fundraiser, took it on himself to help. But even as he sent off the first of many rounds of begging letters, he warned those of us who had joined the campaign that this would be much harder than we expected. ‘Terror terrifies,’ he said bleakly. Cranborne enlisted the help of his old friend Lady Jane Dawnay, daughter of one duke and ex-wife of another. Brought up in Northern Ireland, she cared passionately about Omagh. But even she was soon gloomily reporting that likely donors seemed convinced that the Real IRA would track them down and murder them in their beds. Fearless herself, Jane was utterly bewildered by the extent of this cowardice. Even large corporations, with armies of lawyers, and wealthy individuals with off-shore accounts were convinced that terrorists would somehow find the source of an anonymous donation. Readers of the Daily Mail, I am glad to say, were not so easily cowed  and money flooded in for the appeal launched by the paper. Meanwhile, the families had endured a fresh outrage when the memorial garden to the dead in Omagh was vandalised. Candles were pulled out of the red lanterns of remembrance and the memorial plaque stolen. 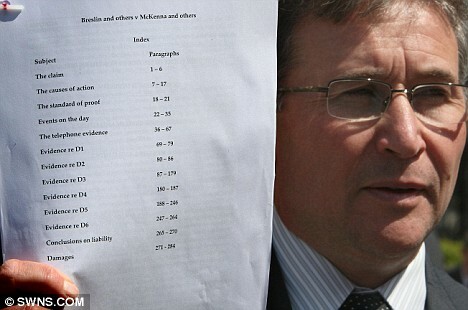 The families had no doubt that the attack was linked to the extensive coverage of their plans to sue. For those about to put their names on the writs, it was the starkest of reminders about the viciousness of the people they were up against. At last, however, those writs were issued, which McCue, true to form, insisted on doing in person, though he knew he risked a beating. On one occasion, sporting a baseball cap, he knocked on the door of a farmhouse in the Irish Republic, and the father of the first of the men he was seeking pulled back a curtain and peered out of the window. The man shouted out: ‘Get out, youse f***ers,’ and shoved the writ back out of the window. The confrontation was captured by photographers and appeared on the front page of the Daily Mail the next day under the headline ‘No escape’. What followed was years of waiting that taxed the patience of everyone. What the plaintiffs wanted was a smooth path to an early trial. What the defendants of the Real IRA wanted was to drag proceedings out for as long as possible in the hope of breaking the spirit of their accusers. The weapons they used were legal technicalities and appeals  the more time-wasting the better. 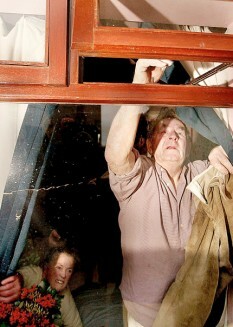 In that time, things were never easy for the Omagh families. The Real IRA were back planting more bombs in Northern Ireland and London, and their resurgence was alarming and distressing. Those in the Omagh Victims’ Legal Action Group knew, too, that their campaign was not universally popular  not even in their own home town.There were those who wanted a return to normal and to stop living in the past. 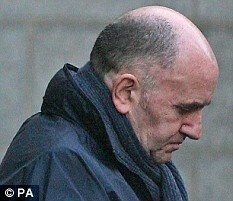 Real IRA leader Michael McKevitt. One family, mourning three victims, wanted no part of the action and said so publicly. Even well-wishers thought the group obsessive and urged them to give up. Their insistence on keeping Omagh in the public view annoyed many who had lost loved ones in equally tragic circumstances in places such as Enniskillen, only 12 miles away. 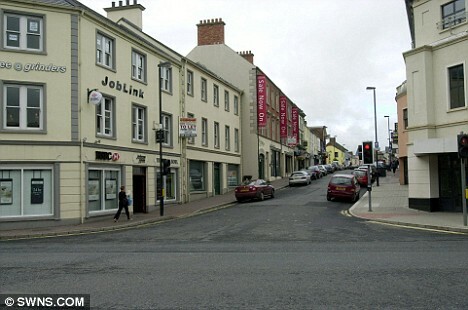 What was so special about the Omagh victims? Likewise, some nationalists passionately committed to the peace process resented the embarrassment to Sinn Fein every time the families pointed out that Gerry Adams and Martin McGuinness still refused to ask witnesses to come forward. There were unionists who resented the group’s criticisms of the police investigation, and there were establishment figures in Belfast, Dublin and London who found them nothing short of a nuisance. The intolerable delays, coupled with their belief that there was an establishment conspiracy which would preclude justice, led to a few families removing their names from the writ. In the circumstances, the real wonder was that any stayed on at all. But the majority did. Bravely they refused to back down, despite pressure on them from so many sides. They would have their day in court and  as we now know  they would win.